ST. GEORGE – Roadwork on Old Highway 91 will start again Monday as crews begin to install guardrails along the roadway. The work will stretch from milepost 4 to 16 and is expected to be completed around mid-July this year, according to an advisory Washington County road officials sent out earlier this week. Until then, motorists can expect delays along the way as they travel the old route between Ivins, Utah, and Littlefield, Arizona. Delays of 15 minutes or more will be common due to lane restrictions and potential safety concerns in the work zones. However, no overnight or complete road closures are anticipated. Motorists are advised to make travel plans with these delays in mind – or just take Interstate 15 instead. The work area is 12 miles long and work crews could be working at many different locations throughout the project. Reduced speeds will be enforced through the work areas. Motorists are asked to be cautious and considerate of the work crews as they move through the work zone. Just as you want to be able to go home at the end of the day, so do the members of those work crews, officials remind the public. Complying to the speed limit and engaging in courteous driving can go a long way in ensuring the safety of the work crews as well motorists and the passengers in their respective vehicles. It can also help prevent becoming acquainted with a Washington County law enforcement officer on unwanted terms. Also watch out for cows. They can show up in the strangest of places. Work on Old Highway 91 started in January with the purpose of improving roadway safety. The project has included widening the roadway, replacing old road signs and improving drainage. The estimated cost of the project is $1.3 million. According to the Washington County Historical Society, SR-91 was formerly the Arrowhead Trail, the first all-weather road connecting Los Angeles, California, to Salt Lake City, Utah. 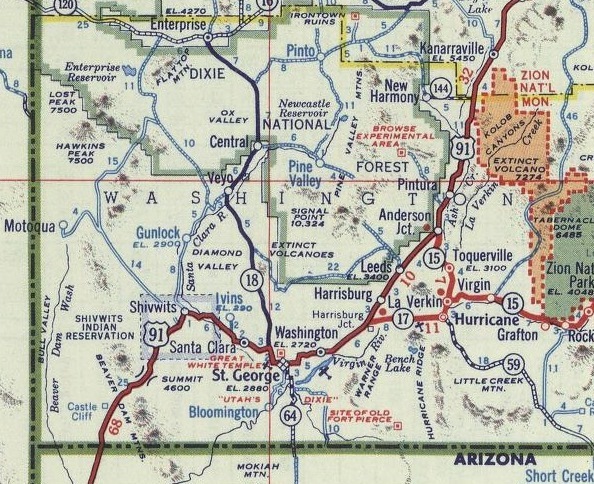 The road became known as U.S. Highway 91 in 1926 when the federal highway numbering system was initiated. The highway was the principal north-south route through Washington County until Interstate 15 was built and the Virgin River Gorge section was opened in 1973. Nice touch including the historical background and map Mori. All Washington County Road crew’s seem to be good at is making an over encumbered mess! What’s next, more chip seal??? ?